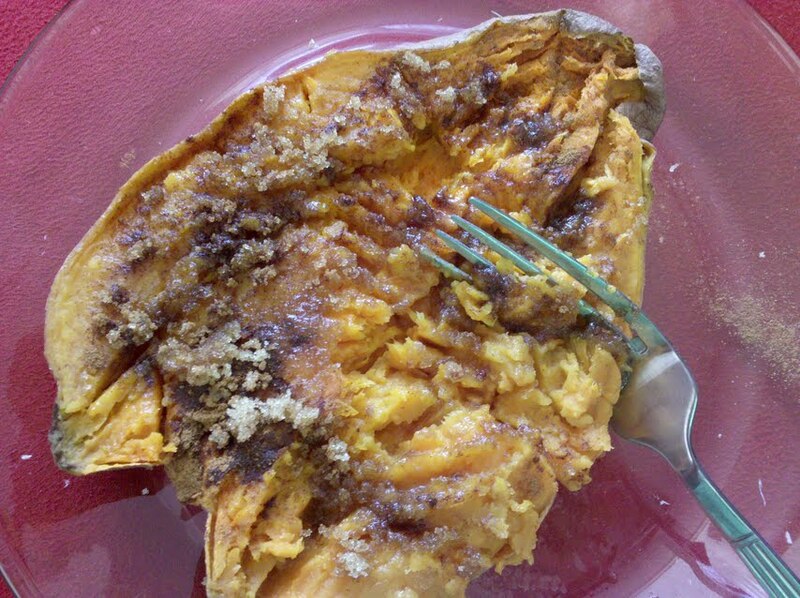 Sweet Potato + Microwave = Tasty! Sweet potatoes first came onto my food radar when I was maybe 15 or 16. I was staying with my oldest older brother for spring break, and he brought food from Boston Market or somewhere similar, including a little dish of baked sweet potato casserole. It was so good! Then I was exposed to sweet potato pie, which tastes suspiciously like pumpkin pie (identical spicing?). And then maybe a few years after that, my mother made sweet potato casserole for Thanksgiving, and then I made it for Thanksgiving once or twice in college. And then last summer I bought a bag of sweet potato fries from Trader Joe’s on a whim for my boyfriend and his summer roommates’ barbeque. And now I happen to be friends with people who are not above making making sweet potato fries from scratch. Needless to say, sweet potatoes are fully on my radar now and something I know how to cook and love to eat. But as much as I love sweet potato casserole, I’m lazy with food. I enjoy cooking but for some reason we need to eat several times a day, which is far more often than I get the urge to cook. I also have a tendency to wait till I’m really hungry to seek out food, at which point I’m not willing to take a half hour or more to prepare a meal. A microwaved sweet potato is essentially a very quickly baked sweet potato (so yes, you can do this for normal potatoes too). I scrub it, don’t dry it, place it on a paper towel on a plate, stab it with a knife several times, and then microwave it for 3-5 minutes, turn it over, microwave it for another 3-5 minutes, remove from microwave, and eat! I’ve been cutting them in half, and then adding butter, brown sugar and cinnamon. It tastes great, doesn’t take long, and it’s healthy. Obviously, you’ll need to adjust the times based on the size of the potato, but I think this gives you a good general idea. Don’t be alarmed by the hissing sound as it cooks, but keep an eye on it because they will dry out if you overcook them. Seriously, give this a shot if you like sweet potatoes but are a lazy cook. I ate the first one too quickly to even consider taking a picture of it, and as you might guess based on the fork, I just barely remembered in time for the second!